As you may know Country Inn Days are designed to refresh mind, body and spirit. The outings enjoyed on Inn days, be they outings to far away places or nearby towns, take me away (literally) from my usual work-a-day world allowing me to escape into a another world of imagination, observation, play and pure delight. Everyone needs to play now and then, especially hard-working adults. All work and no play eventually takes its toll making even the most interesting people droopy and dreary. 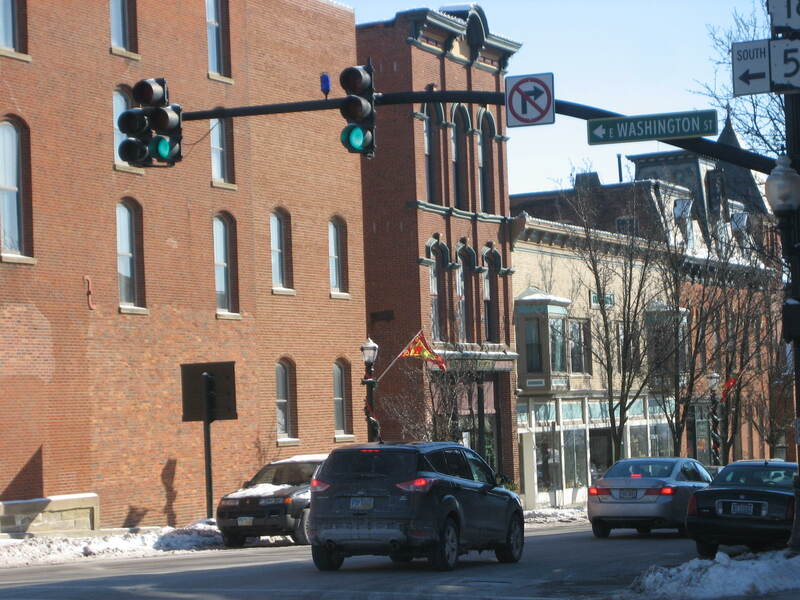 And so I hit the road today for an outing in the town of Medina. 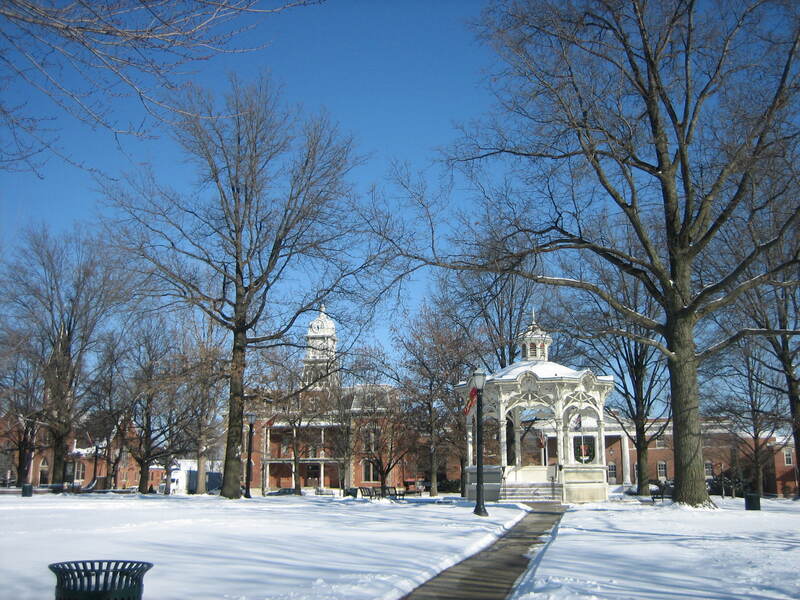 CNN Money named Medina, Ohio the 40th most desirable American city to live in. 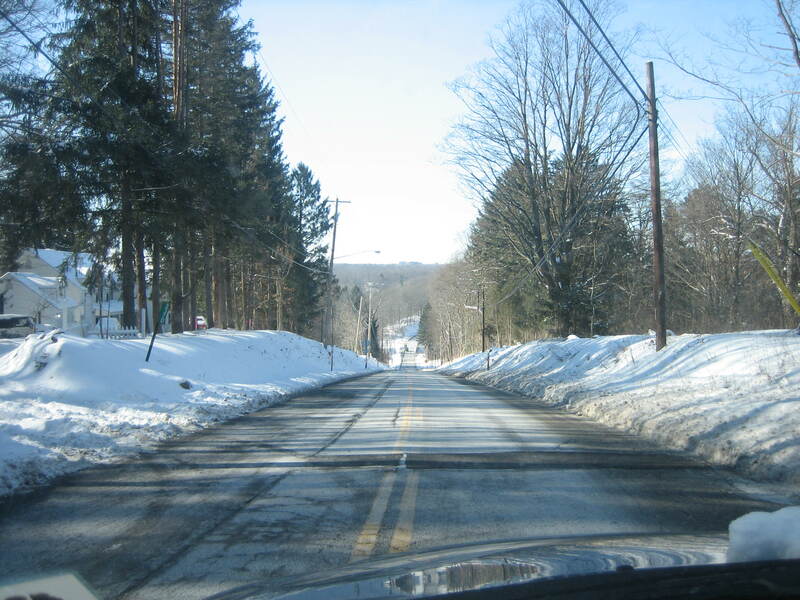 The town was founded in 1818 as part of the Connecticut Western Reserve. It is 30 miles south of Cleveland and 20 miles west of Akron. I love to visit historic towns like Medina because I find the old architecture beautiful and charming. 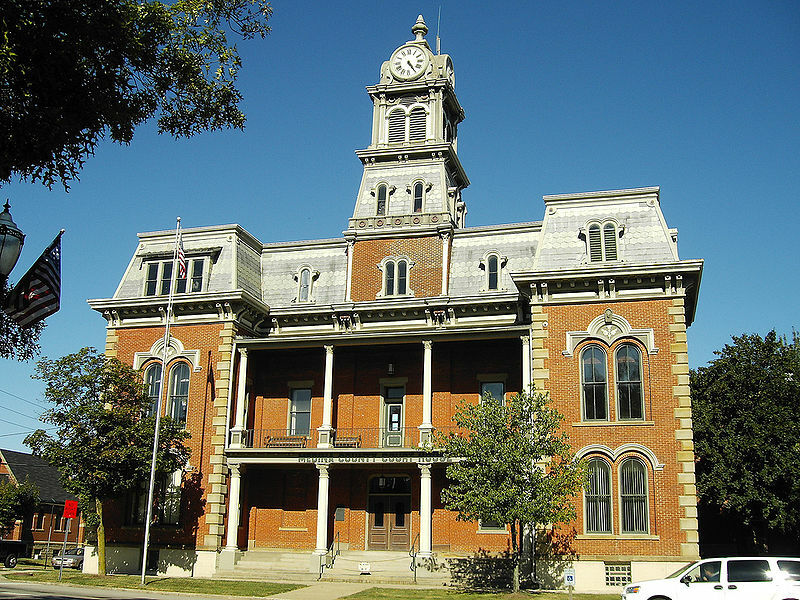 Unfortunately two disastrous fires hit Medina in the mid-1800s so it lost many of its original buildings. So sad! The fire of 1848 destroyed the entire business district, then in 1870, another large fire broke out that destroyed 45 more buildings and nearly wiped out the entire city. It took almost ten years to rebuild the area which would become known as Town Square. 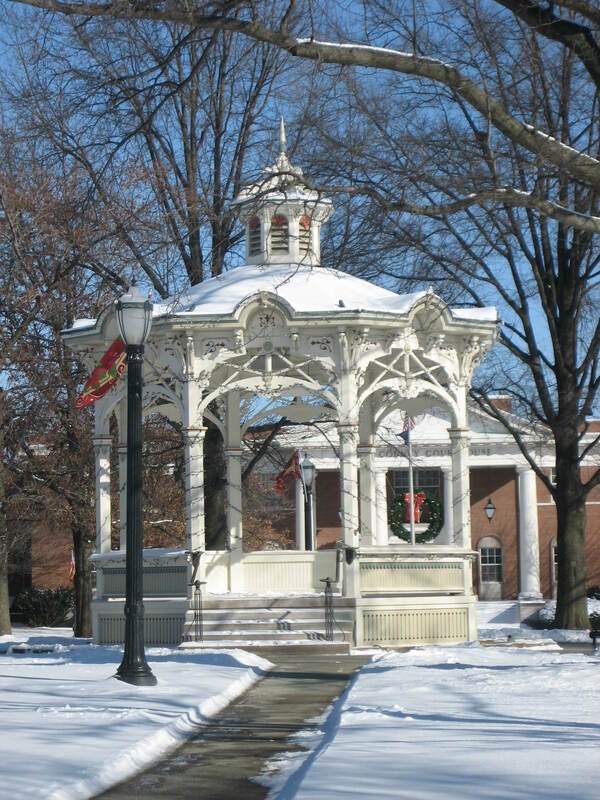 This beautiful gazebo sits in the middle of Town Square today and this Square is now considered a historic district that holds nine blocks of stores and draws many visitors here, visitors like me. I have the distinct feeling I’m back in Boston, where I used to live, whenever I come to old towns like Medina and stroll past historic buildings like those here in and around Town Square. Even a cold Winter’s day can’t keep me from fun outings like this on Country Inn Days. Today my ears are bright red as I duck in and out of buildings, but what’s a little cold when I’m having so much fun. Besides, beauty always warms my heart and what’s more beautiful than blue skies mixed with charming architecture, big old trees and a free day of exploring? 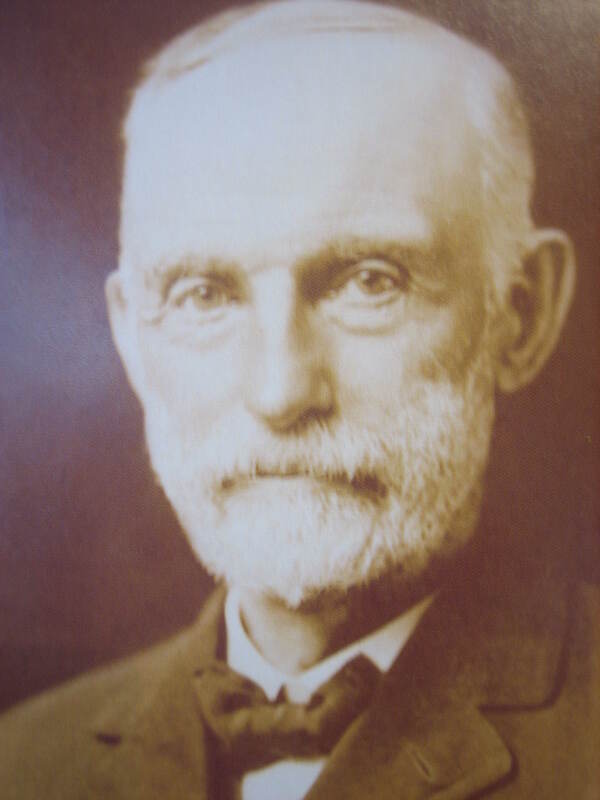 I’m introduced to new people on Country Inn Days too, people like Amos Root who in 1869 founded the A.I. Root Company . Why, he can become one of my “dead friends”. 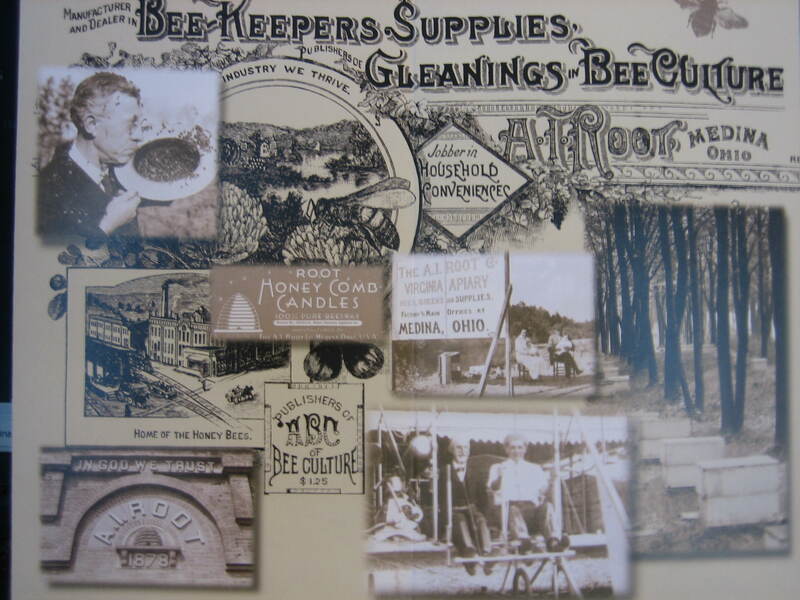 I learned Amos was a manufacturer of beehives and beekeeping equipment, and Medina became a center for beehive manufacturing because of him. 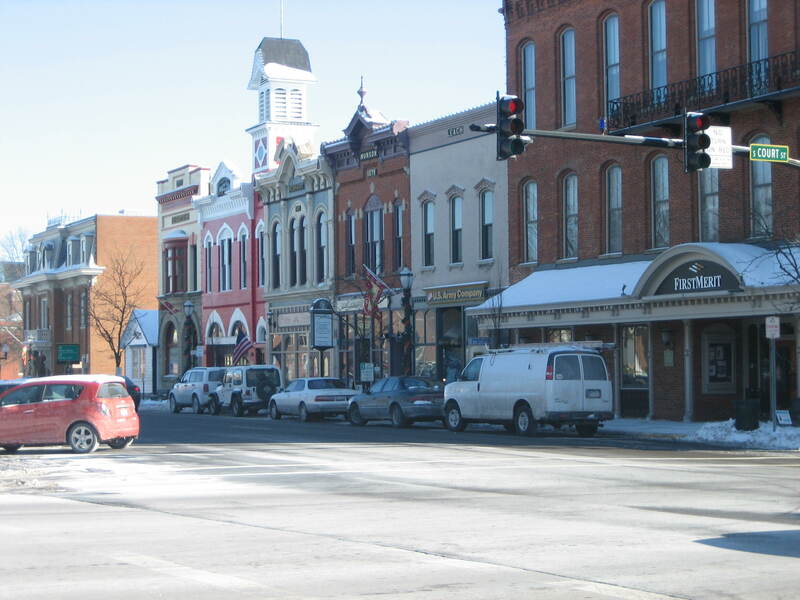 The Root Company had 97 workers in 1886, making it the town’s largest employer. 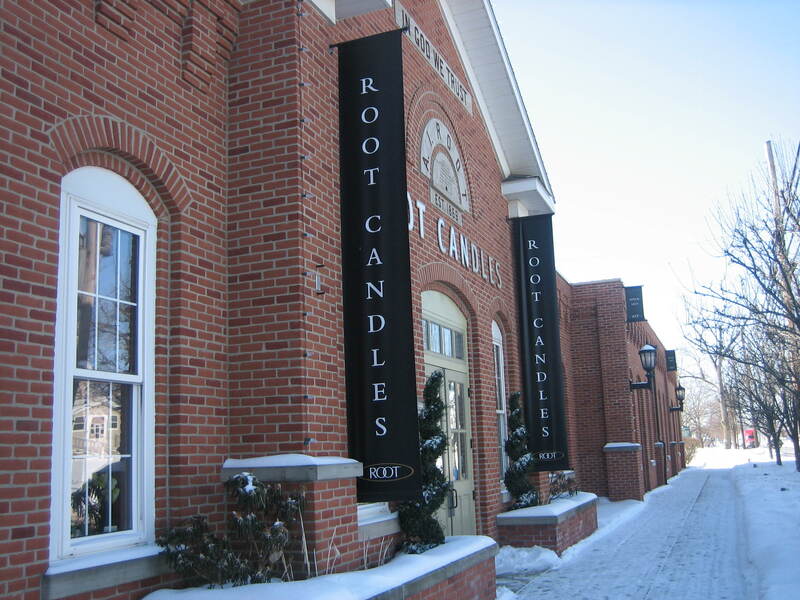 Well, one thing led to another as often happens, and now Medina is the headquarters for the Root Candle Company. Perhaps you heard of it. Thier flagship store is here. It’s huge, and because I love to burn candles all through the year I check it out. Come with me. 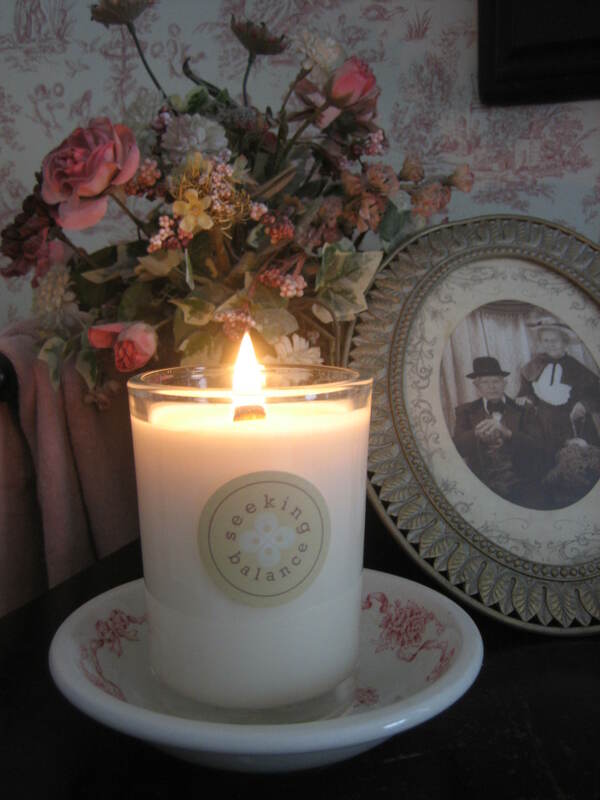 This building is delightfully fragrant because many of the candles are perfumed, carrying the scent of salted Caramel, Cranberry, Bayberry, English Lavender and oh, so many other fragrances all wafting through the air together. 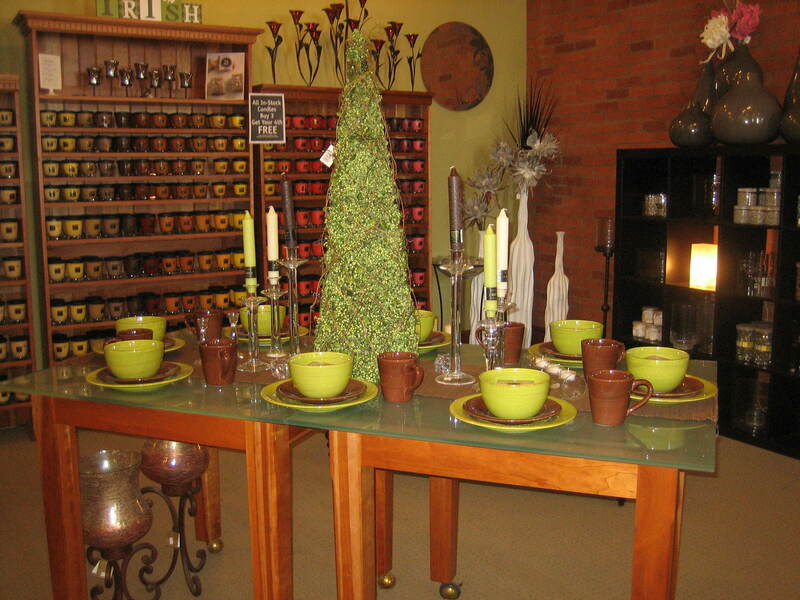 Because I enjoy having dinner parties I particularly love seeing the many tablescapes around the store. These arrangements provide all sorts of interesting ideas for lighting a dinner table with the glow and twinkle of candles. This retail store has many rooms, but after browsing through all of them you can walk around to the back of the building where the outlet shop is located. The outlet shop is where the bargains are. 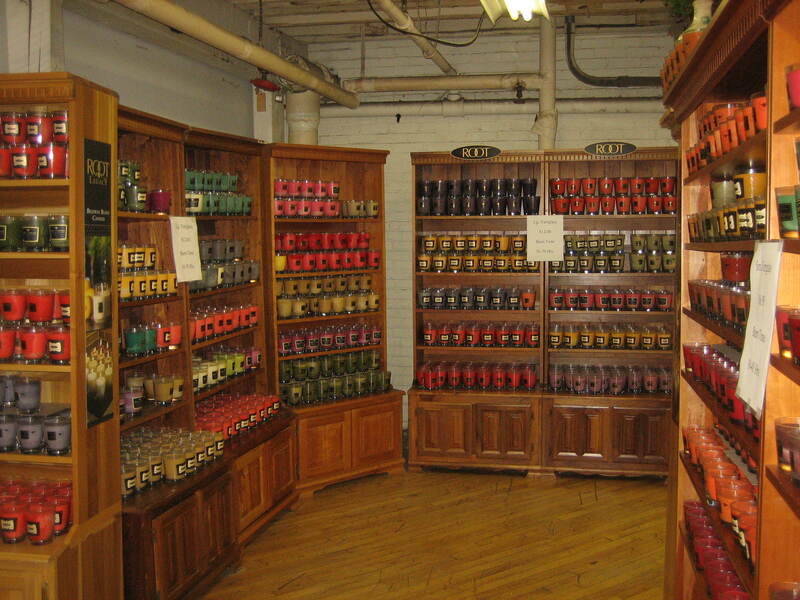 If a candle has a small imperfection it comes to this place and is discounted. 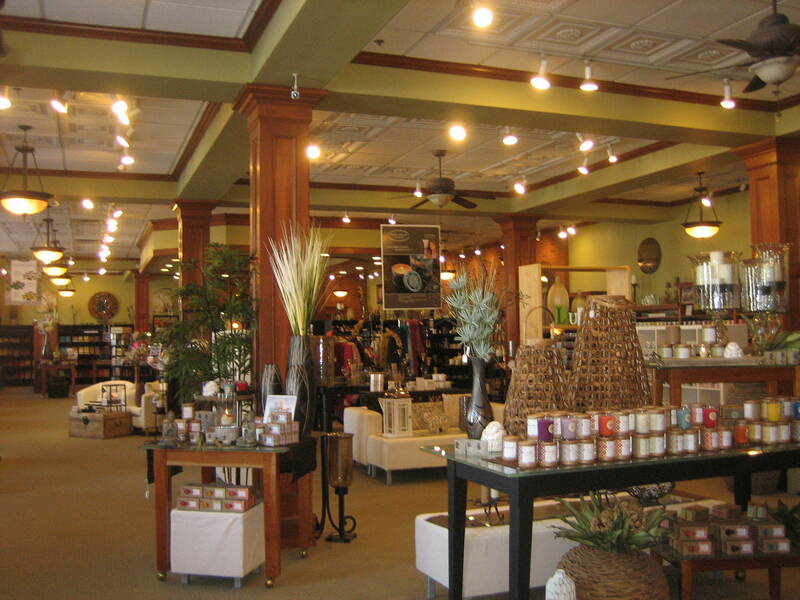 Honestly, some candles here look quite perfect to me, but I’m in a frugal mood today so it’s here I shop. 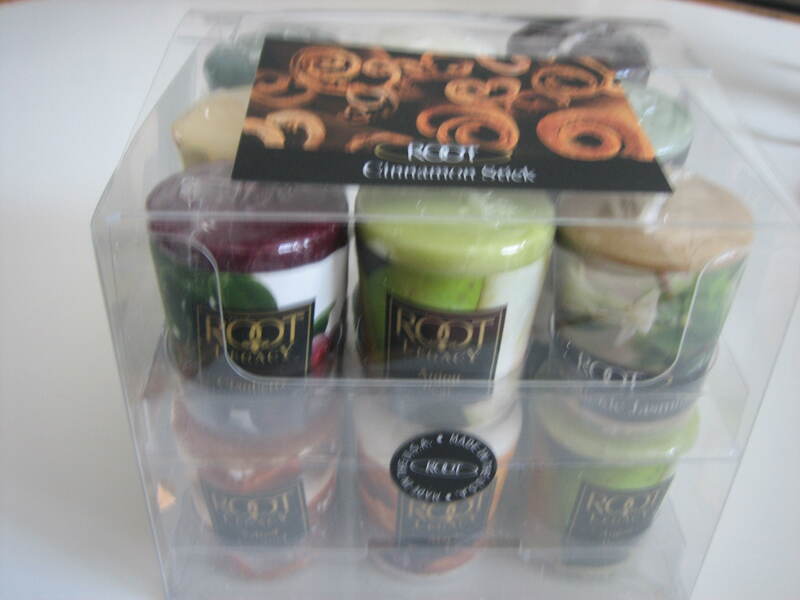 One item I purchase is a box of 18 votives, each in a different scent. These votive candles will delight me and my students at piano lesson time. Another purchase I make is a six pack of this fragrant candle which is labeled “seeking balance”. I will use these candles in my boudoir at bath time. But all this browsing and shopping makes a girl hungry and it is getting to be lunchtime so I leave Roots before I spend too much money and take to the sidewalk looking for a charming restaurant, and I find one too. 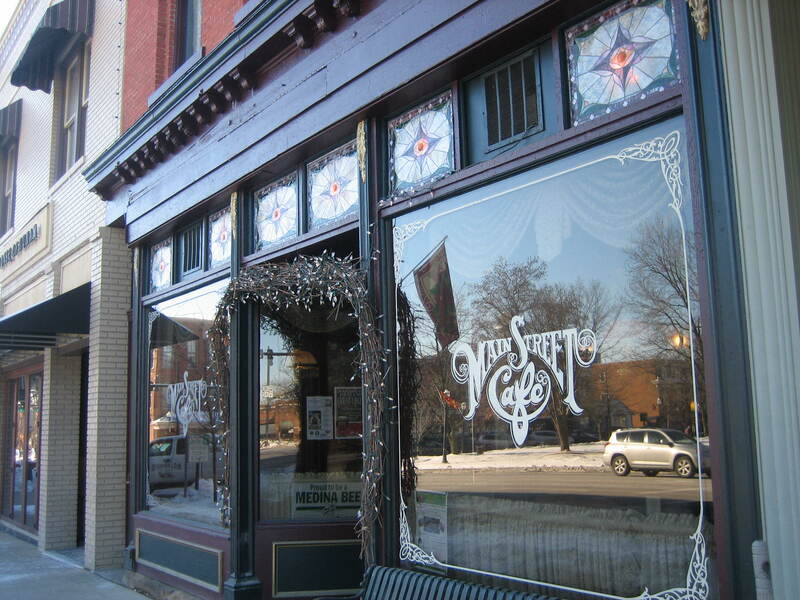 It’s called The Main Street Cafe and it’s right across from the Town Square. Notice the stained glass in its front window. Charming! The whole place is charming. I’m shown to a nice quiet table for two that’s set next to a lovely old brick wall. Who will join me for lunch? It will be Patricia and Walter Wells. You say that makes three and I have a table for only two. No problem. 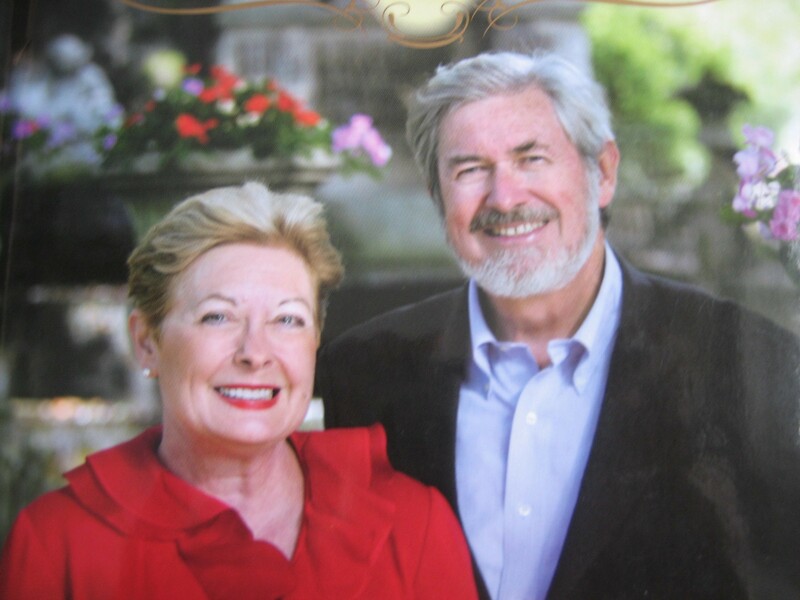 You see Patricia and Walter are joining me “in spirit” only by way of a book they’ve written. Their book is called “We’ve always had Paris… and Provence” and in it they talk about their lives lived in Paris for the past 30 years. Patricia runs a popular cooking school there and has been a restaurant critic. Walter is a retired executive editor of the International Herald Tribune. So though my table has only 2 place settings with a little imagination (and Country Inn Days are full of imagination) I have great company for lunch. 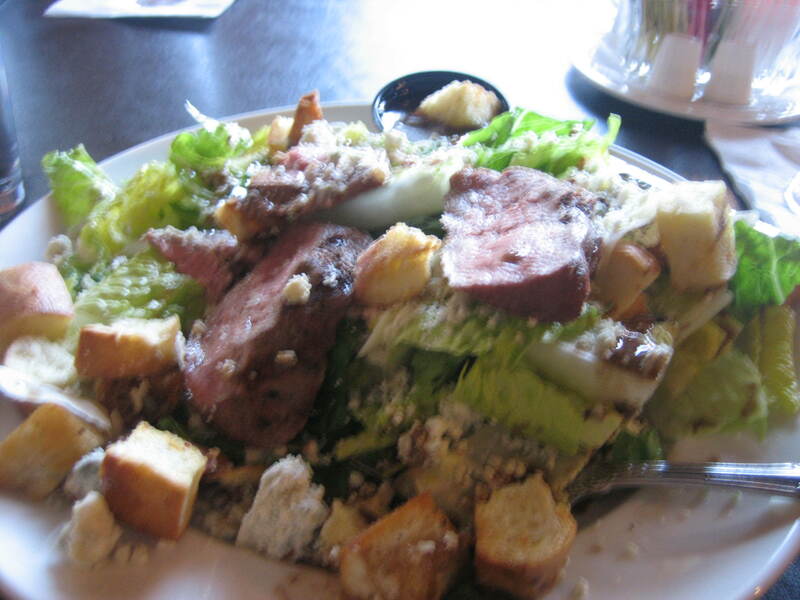 My steak salad arrives (yum) and as I devour it Patricia tells me stories about other charming restaurants she visits in Paris and other yummy foods she enjoys there. She shares recipes with me too, recipes like Almond Macaroon and Fresh Berry Cake or Eggplant in Spicy Tomato Sauce. How pleasant to enjoy food and wine while looking out the window at the lovely Town Square and hearing stories about other wonderful outings in other wonderful places. I’m rested, refreshed and inspired all at the same time. That’s a Country Inn Day for you. I love my Country Inn Days. They’re so FUN because they’re so full of my favorite things. Of course I can’t tell you every little detail of my Inn Day but I do want to share a bit more of today with you. Why? You know. Sharing doubles the joy. 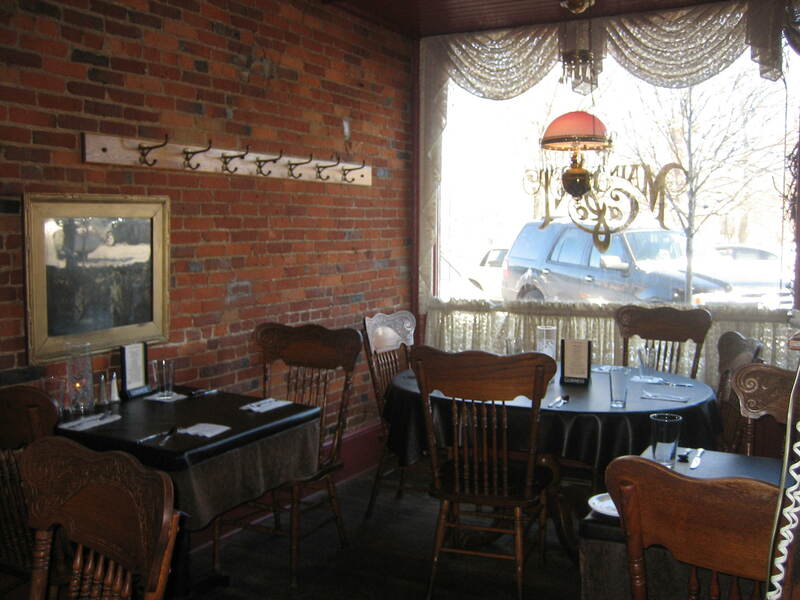 After a bit more poking around Medina I decided to stop at Miss Molly’s for some tea before heading back to the Inn. 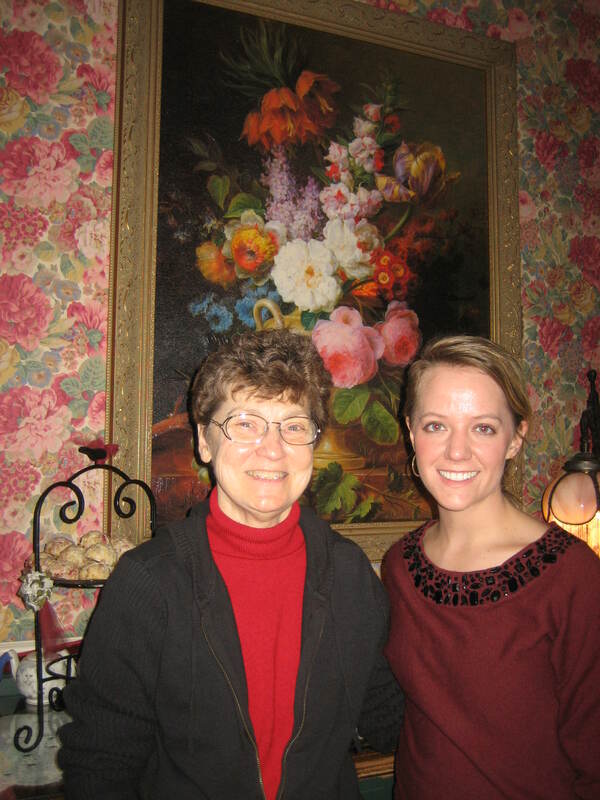 Miss Molly’s Tea House is a Medina institution. 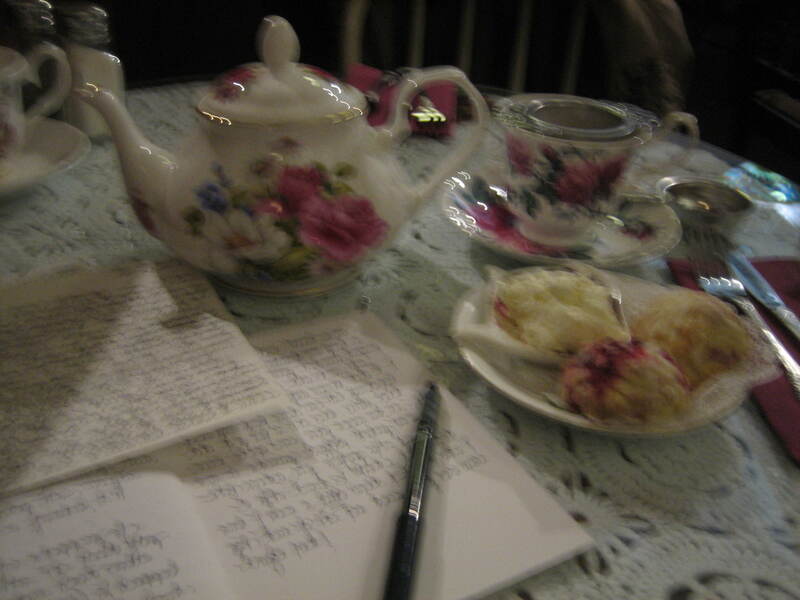 I am lucky to arrive after the busy lunch crowd so even though the kitchen is officially closed I am still invited in for tea and sweets by a very nice server who is pretty sweet herself with a bit of a Southern accent. 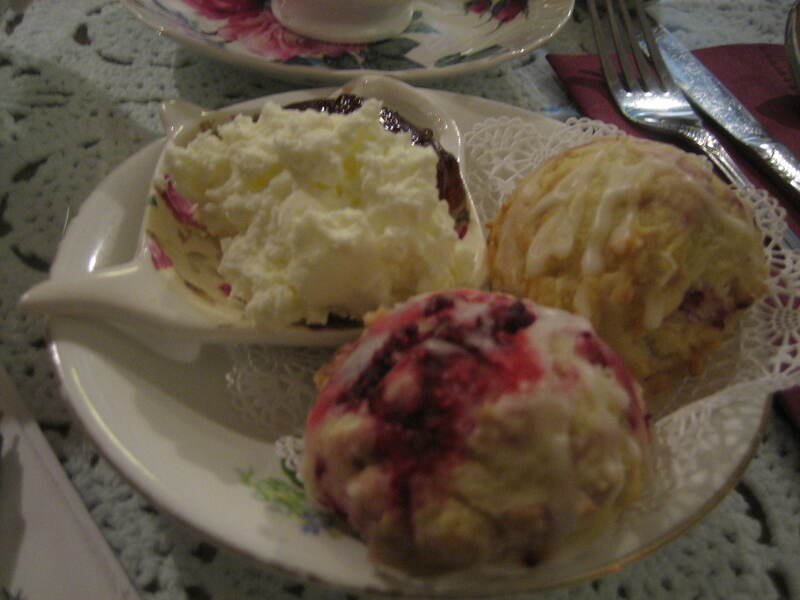 I tell Barbara all about today’s fun as I nibble delicious scones served with jam and clotted cream. Don’t they look good? Well, there are good! And besides meeting Amos Root today, my newest “dead friend”, I meet two very lovely ladies who are quite alive. There’s Molly, not THE Molly which gives this tea house its name, but rather my very sweet server, and I’m also fortunate to meet one of the owners. It’s Dinah. It was very smart of me to pop in here at a slow time for I had the tea house to myself and had the chance to have a nice long chat with these two ladies. 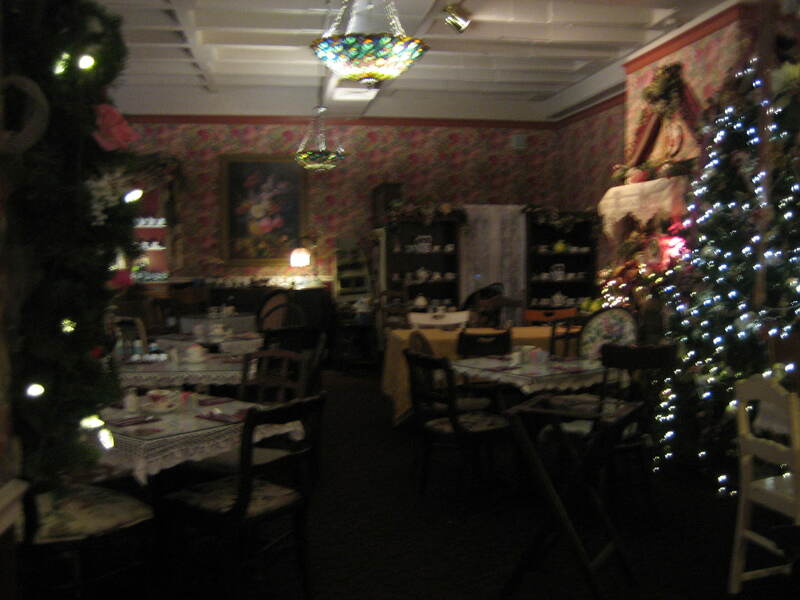 In fact, I plan to invite them to one of the teas I host back at my Inn on some future Country Inn Day. As you know Country Inn Days have me assuming many different roles – Inn Guest of course, but also Inn Chef, Inn Maid and Inn Keeper and as Innkeeper I’m always inviting both old and new friends to come on over for a visit livening up the place with their smiling faces and interesting life stories. After all, a home, (my Country Inn of imagination) like all good things, is meant to be shared. 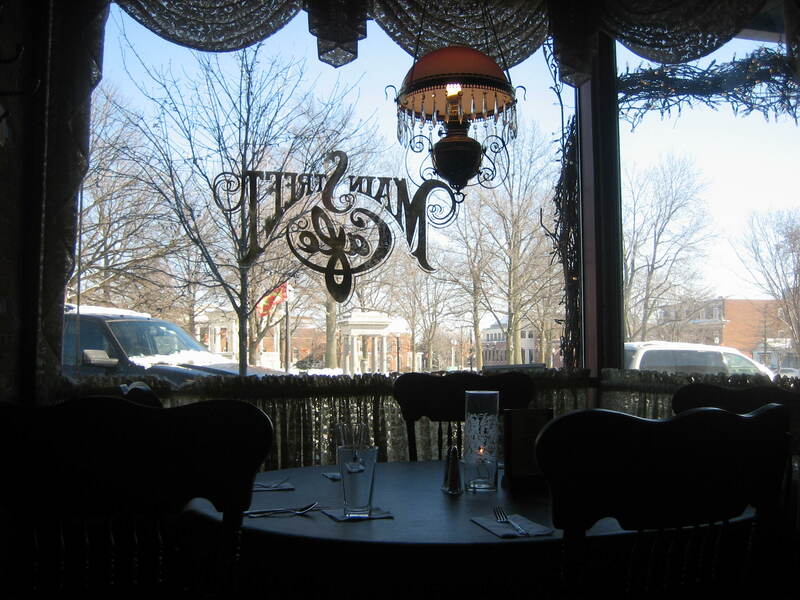 So after a delightful time at Miss Molly’s Tea House and a delightful day in Medina it is finally time to get back to the Jeremiah Brown House where I, now as Inn chef, must put together a simple dinner for a regular guest there, my husband. Thinking ahead, as Inn Chefs must do, I assembled a beef stew yesterday which went into a slow cooker this morning, so like magic I can return to the Inn after a day out and still present a tasty dinner in no time flat. Pretty smart, huh? Patricia Wells would be proud of me and hopefully approve of my table here at the Inn. 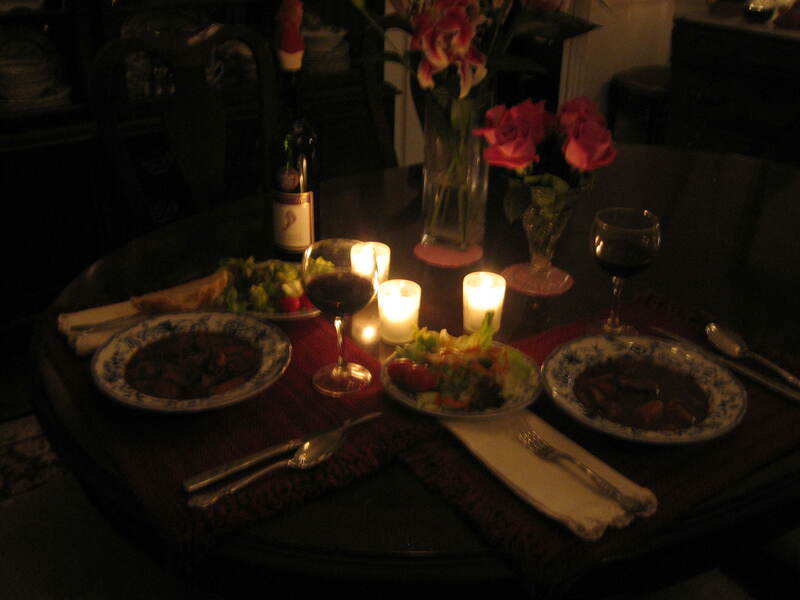 Some roses, some wine, music, a salad, and another Country Inn Day is winding down with a nice evening meal. I’m glad you could join me today and I look forward to your company on my next Country Inn Day. So till then be happy, and remember what Henry Ward Beecher wrote in his Life Thoughts. 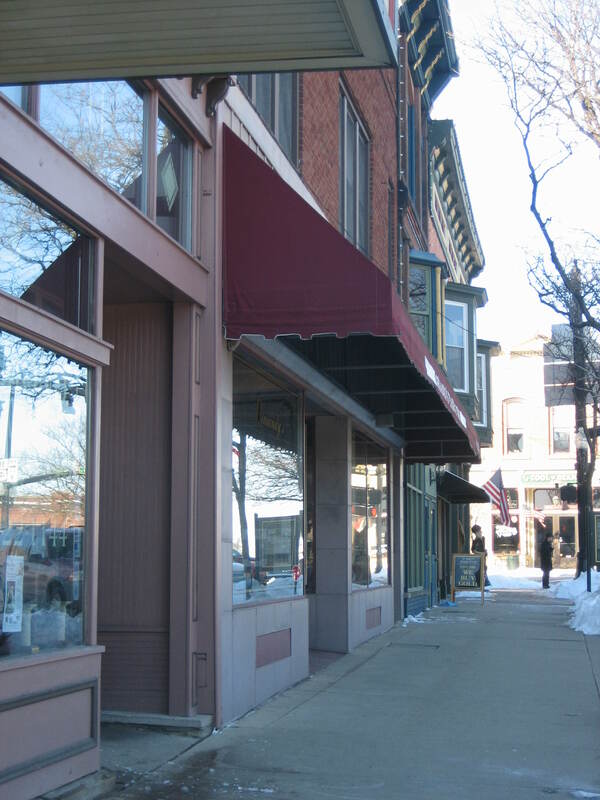 Oh, Medina is one of my favorite towns!! It is just so pretty! Your lunch looked so good but I was wondering – “why didn’t she go to Miss Mollie’s?” And lo and behold, you did!! I just love their scones with the glaze. My favorite ones are the blueberry. I just love going on these “Country Inn” days with you!! . Nice to hear from you and glad you can share in my Country Inn Days. Sharing doubles my joy. It really does!